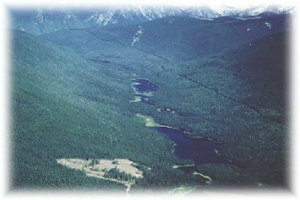 A wilderness area, noted for a series of mid-elevation lakes and wetlands in a valley parallel to the upper Adams River. No camping or day-use facilities are provided. This is a wilderness area with limited Park Ranger patrols. Visitors must be self-sufficient, and notify a responsible adult of anticipated date of return. Vehicle access into the park is not recommended. The road is not maintained and very overgrown. Campfires are not permitted. No firewood is available and no fire rings are installed. The gathering of firewood in a Park is illegal, so fires should only be used in emergency situations. If a fire is necessary, please keep it small and ensure it is completely out before you leave. Use a campstove for cooking. 175 km northeast of Kamloops, accessed via 44 km of logging roads from the north end of Adams Lake. The closest communities, towns and cities are Kamloops, Clearwater, Vavenby and Chase. History - Established April 30, 1996 as a result of recommendations made in the Kamloops Land and Resources Management Plan. Conservation - This park contains a good forested and riparian fringe with small patches of old-growth spruce and cedar/hemlock around Harbour Lake. Noted for the biological diversity associated with a series of mid-elevation lakes and wetlands. Many creeks flow into the lakes on both sides from steep slopes. Wildlife - Provides habitat for moose and mountain caribou. The lakes contain wild rainbow and minnow species. There are canoeing or kayaking opportunities in this park. This lake system has wild rainbow trout. Anyone fishing or angling in British Columbia must have an appropriate licence. You are responsible for behaviour of pets and domestic animals and must dispose of their excrement.Backcountry areas are not suitable for dogs or other pets due to wildlife issues and the potential for problems with bears. There are no designated swimming areas. There are NO LIFEGUARDS in provincial parks. Snowshoeing is permitted but there are no maintained trails.